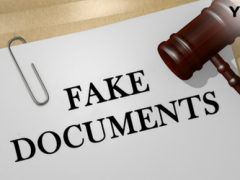 AN employee who tendered false or counterfeit certificates in support of his application in order to obtain employment or a post in the company or has intentionally given false information in support of work experience would be deemed to have committed a gross misconduct. Similarly, providing false documentation like a fake certificate to support his application is also a serious matter. An employee who commits fraud by presenting false or counterfeit certificates to secure a job risks immediate dismissal if the fraudulent deceit is uncovered after years of employment. In Kamaruddin Beedin v Indah Water Konsortium Sdn Bhd, the claimant was employed by the company as an operator. After some 12 years into his employment, the claimant applied for the position of technician in the company and in support of his application he submitted a certificate purportedly issued by a management and technology centre. Upon checking with the institution, the company discovered that the centre neither conducted such a course, nor was the claimant registered as a student with them. Following the finding of the domestic inquiry panel, the claimant was dismissed from service. The claimant contended that his dismissal had been without just cause and excuse. The Industrial Court held inter aha, that the company had proved that the claimant had deliberately furnished a fabricated academic certificate to bolster his application for the post of technician. In particular, the Industrial Court stated: "By his actions, he had clearly shown a betrayal of the trust and confidence that had been reposed in him by the company. His lamentations in relation to his length of unsullied service and his self-perceived lack of opportunity for further training and/or courses, seemingly contrived by the company, could not in the circumstances of the case be taken as a redeeming factor in his favour. The misconduct perpetrated by him had justified his dismissal." It is noteworthy that knowingly issuing a false certificate is a criminal offence under the Penal Code. For example, in Chua Sin Teng & Ors v Public Prosecutor, the driving tester was convicted under Section 197 of the Penal Code for knowingly issuing a false certificate of passing a test of competence to drive. Likewise, falsifying certificates is a criminal offence under the Penal Code. Section 463 of the Penal Code provides: "Whoever makes any false document or part of a document, with intent to cause damage or injury to the public or to any person, or to support any claim or title, or to cause any person to part with property, or to enter into any express or implied contract, or with intent to commit fraud or that fraud may be committed, commits forgery." Intentionally giving false information in support of work experience would be deemed a gross misconduct that would warrant immediate dismissal even if the fraudulent deceit is uncovered after years of employment.